Strawberry season is in full swing across most of the country, so chances are you're buying lots of them. You are, aren't you? Then that also means you likely have a few soft or slightly bruised berries -- good enough to eat but not pristine enough to showcase on the top of a strawberry shortcake. Well I'm not going to suggest you use them to make sweet jam or a smoothie (though I love both). I'm going savory with strawberries. That's right. If you've never paired strawberries with meat, then expect to be wowed. Succulent strawberries and creamy mango are enhanced with aromatic anise seed in this simple yet flavorful salsa. The fruits' sweetness provides the perfect balance to the savory, buttery flavor of the pork tenderloin. I hope Jeanne of Cook Sister! likes savory strawberries because this is my entry for this month's WTSIM: Berried Treasure. 2 cups cooked grain of your choice, such as cous-cous, quinoa, or white rice. Cut the tenderloin into medallions, and season with salt and pepper. Let stand for about 10 minutes. Meanwhile, for the salsa, melt butter in a large skillet over medium heat. Saute the sweet onion for 3-4 minutes, or until slightly softened and browned. Stir in the anise seed and diced mango, cooking for 2 minutes more. Add strawberries and cook 2-3 minutes, until slightly softened. Season with salt and pepper. Remove from heat. In a large skillet over medium-high heat, melt 2 teaspoons olive oil and 2 teaspoons butter. Add the pork; cook for 3-4 minutes, until crispy and browned, then flip and cook until browned all over and just cooked through (the meat should be tender). 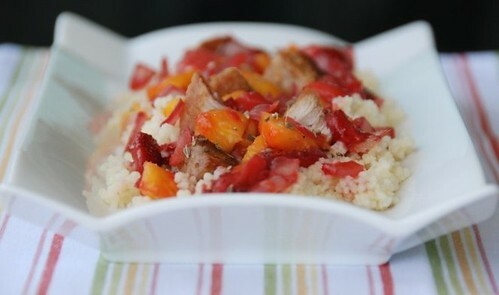 Place cooked grain on a platter, add cooked pork, and cover with warm fruit salsa. Serve immediately. Looks and sounds wonderful! Drool worthy photos, as always, Susan! I love how you put the anise seed in there, what a nice new approach for a salsa, love it! Wow, that looks good. I think I will have to try it. My husband's not a big fruit person, but the savoriness (is that a word?) of this dish just might win him over! This looks wonderful, Susan! We love fruit in pork dishes. The use of strawberries in the salsa is inspired! I am always interested in food pairings. This is very interesting. P.S. I responded to your query about black cod on my post. Maybe moving on to this weekend's menu . . . thanks for the inspiration! Looks divine, too bad the season is practically over here (Italy). We stuffed ourselves with strawberries in May and now they are getting harder and harder to find. The weather really threw the seasons off this year. Oh well, I'll just admire and wait 'til next year. Ooooh, I can think of a bunch of ways to use this salsa, and it's prime strawberry season here in New England. Will pick up some berries at the farmers' market tomorrow morning! I love strawberries in savoury dishes susan. This is a lovely sounding salsa with the anise. marie-It really enhances the flavors of the fruit. lori lynn-I'll come check it out. Thanks. sarah-Anise seed is really lovely in savory dishes. I hope you like it! grace-Brown sugar and oj? What's not to love about that? lydia-Have fun at the market! dhanggit-Do you see the big smile on my face? helen-Then you'd really like this salsa. Pork is such a nice meat with a sweet sauce. The strawberries sound heavenly and exciting with a pinch of anise. I love the photo below of the apricots and cherries. 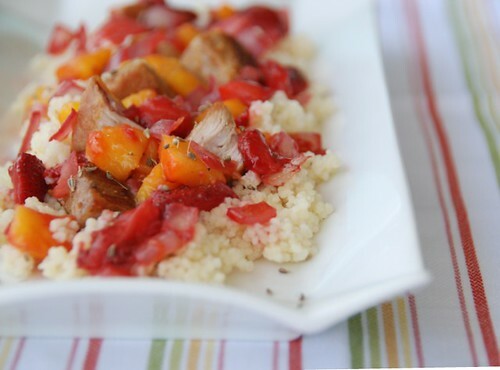 Pork and fruit are such good companions... and this salsa is truly beautiful. This is something I probably wouldn't think of doing Susan...but you just make it look so good! I definitely need to give this a go! The salsa sounded so delicious and I loved the beautiful spice that goes with it. lovely presentation. wow that's just beautiful! awesome colour and it must be so refreshing. Oh Susan - inspired!! I was hoping to get some unusual savoury berry recipes and you've come up trumps, as always :) I am definitely going to try this as I'm always lookign for new things to do with pork tenderloin. Love the photos and I particularly love this dish with the angled sides which I've seen on Foodblogga before . Want one! You're killing me with all those delicious recipes. Now that is an interesting recipe! I've not done strawberries in this way before - it's so colourful! Great idea and looks and sounds delicious! You're like the Thomas Edison of the culinary world! Susan-this is a fantastic looking dish. Love the colors and flavor combinations. I just picked my first batch of local strawberries this morning! This is new to me but sounds delicious! I've only had strawberries in a savory application once before, and I was incredibly suspicious but had to try it anyways expecting to be revolted (it was a sauce paired with crab dumplings). I was stunned by how good it was! prudy-The anise really brings out the natural sweetness of the strawberries. jeanne-I thought a savory dish might be interesting too, so I'm so happy you like it! nicisme-I hope you give it a try! tw-Now, that's a comparison I never would have thought of. Thanks! mike-Berries are really lovely in savory dishes, though I haven't tried it with crab. I'm printing this one out. Boy, you're on a roll lately. I think I've printed several from you lately!! I just picked up some French strawberries from Chino Farms yesterday. They're incredible... sweet and soft and ohhhh! I bet they'd be good in this dish. I was headed down the grilled peach path for our pork tonight, but you've got me thinking about strawberries now...And the mangoes? YUM! I never think of using strawberries in savory dishes-thanks for shaking up the way I look at berries! i'm thinking salmon with it. i like to leave the swine alone, but this looks really nice. this is a delicious dish, love having mango! What a lovely looking dish! 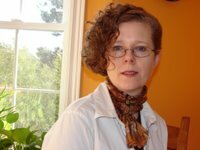 It's funny, I'm a relatively new food blogger, and my fiance is an allergist who is starting an allergy blog. I read this and was like "Hey! That'll be us soon enough." Also, while I am in negotiations to make peace with the banana, I do love me some pineapple, so this recipe may ease diplomatic relations between myself and the humble banana. Thank you. lori-Really? That's wonderful. Thanks for letting me know. I've heard those strawberries are amazing. Enjoy! flanboyanteats-Sure, salmon would be lovely. i love how you're combining savory with sweet... this looks so good! Oh, how lovely. I've never had pork with strawberries before. Looks divine! Really like the sound of that salsa. It will definitely go will with pork tenderloin.